Do you own a small one-room dehumidifier? If you do, the reasons for running it are essential to you. Most homeowners use a dehumidifier to eliminate the dampness and musty smell of a basement. A home dehumidification system has that and many other benefits of controlling the humidity in your home with minimal maintenance. Mold grows best in humid places. Having a dehumidifier lowers the moisture in the air and thus decreases the chance for mold. A dehumidifier also reduces the amount of dust in your home, so you clean less. Humidity isn’t good for Asthma suffers. And if you have allergies, many triggers (mold, dust mites, mildew, pollen) increase with moisture in the air. Lowering the humidity in your home makes the atmosphere less hospitable to the irritants that cause allergies and may bring on an asthma attack. A dehumidifier takes the water out of the air which helps the air conditioner run better in the humid summer months. The Air Conditioner doesn’t work as hard to reach the desired temperature, which translates into saving money on energy costs. Another cost savings for your energy bills is the dehumidifier allows the thermostat to be set 3 degrees higher to receive the same comfort level. A less humid environment also means items like bread, cereal, cookies, and crackers stay fresh longer without getting stale. You throw out less and keep more food longer. Have you ever seen a cockroach in your basement? These pesky little bugs thrive and live in wet, humid places. Eliminate what they love to live in, and you eliminate the bugs! High humidity is evidenced in different places in your home. Water stains on the walls and ceiling, condensation on your windows, musty or mildew smells in the bathroom or other areas of the house. If you have a collection of any kind, a dehumidifier may help protect it from the dangers of excess humidity in the air. A dehumidifier also prevents rust and corrosion on electronics and tools. 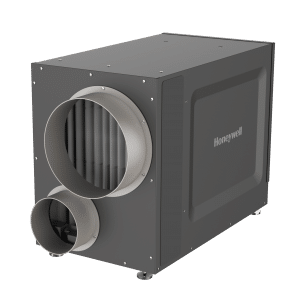 Bill’s Heating and Air Conditioning has chosen to install the trusted Honeywell brand of Dehumidification Systems for our customers looking to eliminate excessive humidity in their homes. This whole-home system works with your ventilation system to help dehumidify all the rooms in your, so every space is comfortable and free of dust, mold, mildew, allergens, bugs, and smells fresh and clean! Call or contact Bill’s today for more information on a Dehumidification System by Honeywell in your home.